I’ve been wanting to eat at a Drake & Morgan restaurant for a little while now, as not only are all of their restaurants so pretty and quaint but the menu is interesting and tasty looking too. I picked The Refinery for a belated birthday meal with my three oldest friends from infant school, all working in different parts of the city and finishing at different times it’s a struggle to all be able to meet at a convenient time so a couple of us turned up early for a drink in bar. The Refinery has quite an extensive cocktail menu, serving a variety of different kinds of mojitos, the usual classics, some unusual favourites (check out the goldfish in a bag)… the list goes on. 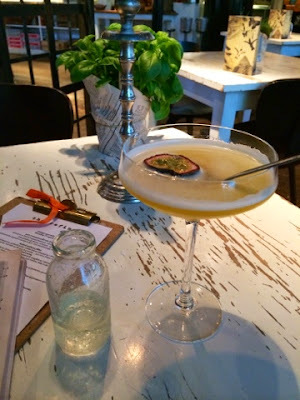 They also have a small section of skinny cocktails that are low on calories… perfect! I loved the dining room at The Refinery, with mismatched chairs, elegant candlesticks on every table, high ceilings, lots of (what looked like) reclaimed wood and a bit of a garden theme with a potted herb plant on every table, it really was very adorable. Even the little reservation marker for our table was lovely. 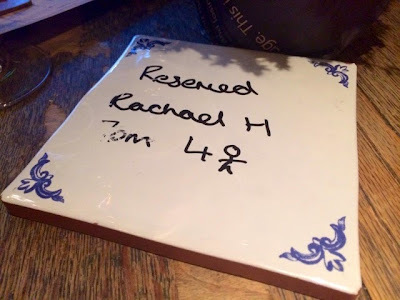 My reservation written on a pretty little ceramic tile was much nicer than those horrible little plastic triangular reserved signs you usually see. I began with the lobster and parmesan croquettes. These were very tasty with a nice little spicy mayo dressing. I did think two was a little on the skimpy side though, three would have been bit of a nicer portion size. 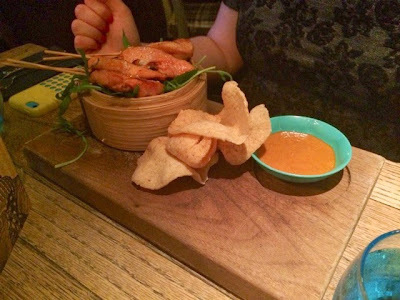 This was highlighted by the enormity of the crispy tempura squid (I definitely had food envy, this looked amazing) and the chicken satay with prawn crackers. All the starters went down very well on the taste front though. 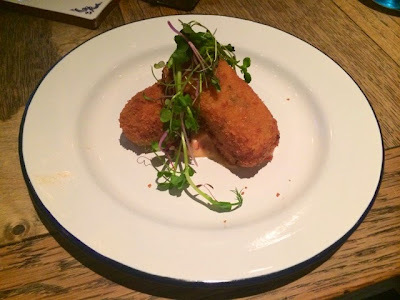 The croquettes were lovely and creamy in the middle, and crispy on the outside as they should be with a subtle hint of parmesan running through which didn’t over power the lobster flavour, very well balanced. 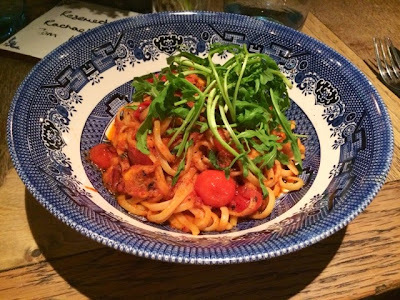 I was obviously in a seafood mood as dinner for me was crab and crayfish linguine, which supposedly had a hint of chilli but could have done with a touch more for my taste, as it wasn’t really very spicy and the sauce had more of tomato flavour than a chilli one. It was still a very tasty and satisfying dish though, the linguine was well cooked, the crayfish was delicious and added texture to an otherwise mostly slippery dish. That’s not a complaint, that’s just what you get from a pasta dish, but the crayfish added some nice little meaty morsels to chew on. Two of the girls ordered fish dishes from the specials menu which went down very well and also came as pretty large portions which is unusual, and quite nice to see, from a fish dish. 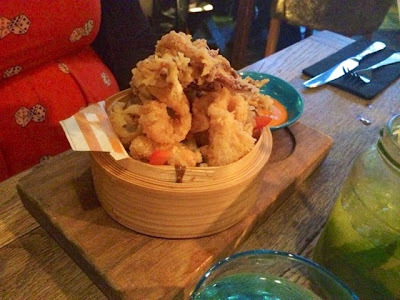 I can often be put off ordering a tasty looking fish dish if I’m particularly hungry as portions are often small. Another of the girls had the chargrilled London pork sausages with mashed potatoes and red onion gravy which, lets face it, you really can’t go wrong with and she stated it was ‘very nice and the mash was lovely and creamy‘. 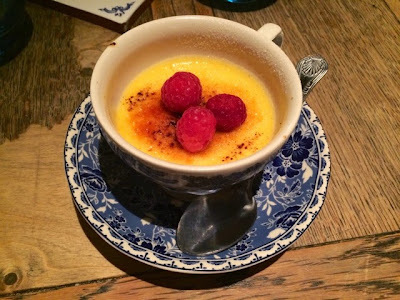 Dessert was a very pretty little crème brûlée of the white chocolate and raspberry variety. It was very creamy and tasty although the top could have been a little crunchier. It also wasn’t too big which was nice as I tend only to want a little taste of something sweet after a meal rather than a heavy pudding when I’m already full up with two courses. Overall I was delighted with my choice of The Refinery for this little get together, everything was tasty, it was a lovely restaurant to sit in, service was very friendly and there’s such a tempting variety of different things on the menu it’d be easy to go back numerous times just to keep trying everything. There’s a couple of great deals on at all Drake & Morgan restaurants at the moment. The first is the ‘reef, beef & bubbles’ on the specials where you get a 4oz steak and fries, half a lobster and a glass of prosecco all for £15 (bargain). There’s also a ‘toast to the roast’ offer for £10 on Sundays amongst others, check out their website for more. The Refinery was the perfect venue for a social gathering and I’ll definitely be visiting there or one of the other Drake & Morgan venues for dinner again.